This article is about the current U.S. Army post. For other uses, see Fort Jackson. Fort Jackson is a United States Army installation, which TRADOC operates on for Basic Combat Training (BCT), and is located within the city of Columbia, South Carolina. This installation is named for Andrew Jackson, a United States Army General and seventh President of the United States of America (1829–1837) who was born in the border region of North and South Carolina. Fort Jackson is the largest and most active initial entry training center in the U.S. Army, training 50 percent of all soldiers and 60 percent of the women entering the Army each year. Providing the Army with new soldiers is the post's primary mission. 35,000 potential soldiers attend basic training and 8,000 advanced individual training soldiers train at Fort Jackson annually. 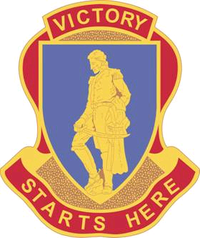 Soldiers who have trained or worked at Fort Jackson live by the base's motto, "Victory Starts Here." The training is provided by the 165th, and 193rd Infantry Brigades Monday through Sunday for a ten-week period. The post has other missions as well. While some military installations have experienced downsizing and closure in past years, Fort Jackson has added several new schools and training institutions since 1995 including the U.S. Army Soldier Support Institute, the Department of Defense Chaplain Center and School, and the National Center for Credibility Assessment, part of the Defense Intelligence Agency. In 2007 the Army consolidated all of its training facilities for drill sergeants at Fort Jackson, and in 2009 Command Sergeant Major Teresa King became the first woman to head what is now the sole drill sergeant school for the U.S. Army. Fort Jackson encompasses more than 52,000 acres (210 km2) of land, including 100 ranges and field training sites and more than 1,000 buildings. Soldiers, civilians, retirees and family members make up the Fort Jackson community that continues to grow in numbers and facilities. An additional 10,000 soldiers attend courses at the Soldier Support Institute, Chaplain Center and School and Drill Sergeant School annually. 12,000 military families make Fort Jackson their home. Close to 3,500 civilians are employed at Fort Jackson and 46,000-plus retirees and their families receive services from this base. On base, visitors can visit the U.S. Army Basic Combat Training Museum, previously known as Fort Jackson Museum when opened in 1974. The museum helps visitors to learn the history of Fort Jackson since created in 1917. Admission into the Basic Combat Training Museum is open Monday through Friday, except for federal holidays, and admission is free. Located in the heart of the midlands region of South Carolina, Fort Jackson was incorporated into the city of Columbia in October 1968 and is midway between New York and Miami. Columbia has direct access to three interstate highways, I-20, I-26 and I-77, and indirect access to two additional interstates within 100 miles (160 km), I-95 and I-85. Average temperatures in the region range from a high of 90+ °F (32 °C) in July to a low of 34 °F (1 °C) in January. Annual rainfall averages around 48 inches (1,200 mm). The fort has a significant economic impact on the local area. Annual expenditures by Fort Jackson exceed $716.9 million for salaries, utilities, contracts and other services. In addition, over 100,000 family members visit the Midlands area each year to attend basic training graduation activities, using local hotels, restaurants and shopping areas. In the 1994 film Renaissance Man, starring Danny DeVito, Mark Wahlberg, and Stacey Dash, basic training scenes from the fictional "Fort McClane" were filmed at Fort Jackson. Ken Berry (1953–1955), dancer, actor, singer, was in the Artillery and Special Services divisions at the close of the Korean War. Rank of corporal. Jim Cook Jr. (2013-2014), New Jersey-based journalist and playwright. Leonard Nimoy, actor, writer, film director, poet, musician, and photographer was in the Special Services division and was sergeant over Corporal Ken Berry. Joe Plumeri, Chairman & CEO of Willis Group Holdings, and owner of the Trenton Thunder, was in the Army Reserve at Fort Jackson in 1968. ^ "Archived copy". Archived from the original on 7 September 2011. Retrieved 25 June 2012. CS1 maint: Archived copy as title (link) Fort Jackson is often said, erroneously, to be named after Thomas "Stonewall" Jackson, an American General who joined the Confederate Army during the American Civil War. ^ "The Sounds of Basic Training". U.S. Army Training Center - Fort Jackson, SC. ^ U.S. Army Names 1st Female Drill Sergeant School Commandant At Fort Jackson Archived 10 December 2009 at the Wayback Machine, WJBF News, AP article, 9 July 2009. Retrieved 9 December 2009. ^ Plumeri, Joe (23 June 2002). "The Boss – An Accidental Start". The New York Times. Archived from the original on 1 October 2010. Retrieved 15 July 2010. Clayton, K. B. History, Annual Supplement: Headquarters, United States Army Training Center and Fort Jackson. Office of the Director of Plans and Training. OCLC 8771088. Department of Defense. 21st Century U.S. Military: U.S. Army Adjutant General School (AG School) at Fort Jackson, plus Army Background Material CD-ROM . Progressive Management, 2005. ISBN 1-4220-0006-0. Wikimedia Commons has media related to Fort Jackson (South Carolina).